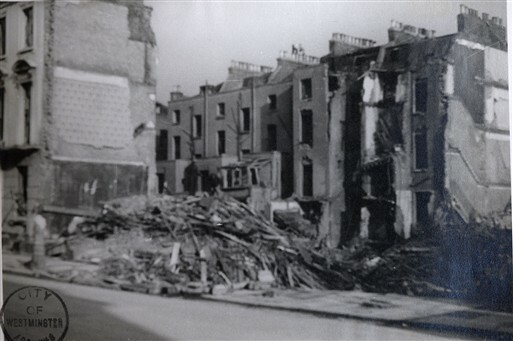 Alderney Street SW1 was hit by a parachute mine in the vicinity of Charlwood, Gloucester and Cambridge Streets at 1.55am on 16 October 1940. The explosion demolished or badly damaged as many as 150 houses, leaving around 300 people homeless and seeking sanctuary in local shelters. 83 casualties were reported including 23 fatalities. One of the fatally injured was a stretcher-bearer from the Dolphin Square depot who refused to leave his stretcher case despite witnessing the approach of the mine. This was the first parachute mine to devastate a heavily populated area in the City of Westminster. ARP personnel worked throughout the night to rescue as many as possible: 11 of their number were found to have been killed by the mine blast. Heavy dust hung in the air along with explosive fumes. Many people were discovered trapped in basements and empty houses. Rescue teams worked flat out for hours to extract as many as possible. One man (buried for twenty-four hours) was sustained by the trickle of a broken water pipe. Among the dead, one man was found shielding a woman and two children. 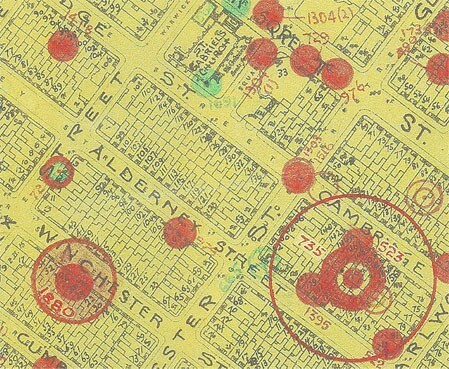 Whilst working in Alderney Street, wardens witnessed another parachute mine descending on the already destroyed area. This time the mine was illuminated by searchlights and destroyed by anti-aircraft fire. In 1950 the site was redeveloped as Russell House.